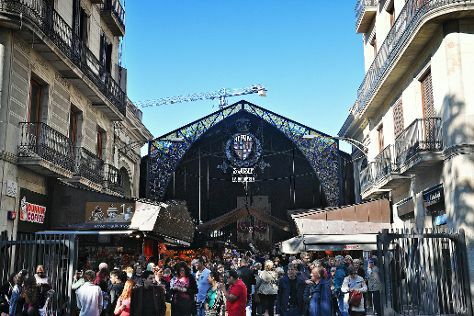 Head to La Boqueria and Inerciafor some retail therapy. Visiting Barceloneta Beach and Fenals Beach will get you outdoors. When in Barcelona, make a side trip to see Cala Banys in Lloret de Mar, approximately 1h 20 min away. There's still lots to do: appreciate the extensive heritage of El Barri Gòtic, stroll around Parc Guell, pause for some serene contemplation at Basilica of the Sagrada Familia, and admire the striking features of Basilica de Santa Maria del Mar. To find traveler tips, reviews, ratings, and more tourist information, use the Barcelona day trip planning app . Jeddah, Saudi Arabia to Barcelona is an approximately 11.5-hour flight. You can also do a combination of bus and flight; or drive. Traveling from Jeddah to Barcelona, you'll gain 2 hours due to the time zone difference. Traveling from Jeddah in May, expect Barcelona to be cooler, temps between 25°C and 16°C. Finish your sightseeing early on the 1st (Sat) to allow enough time to travel to St. Lawrence Gap. Kick off your visit on the 2nd (Sun): tour the pleasant surroundings at Accra Beach, kick back and relax at Rockley Beach, and then stroll through Dover Beach. Keep things going the next day: take a tour by water with Boat Tours & Water Sports. To see other places to visit and tourist information, refer to the St. Lawrence Gap trip planner . The Route module can help you plan travel from Barcelona to St. Lawrence Gap. Due to the time zone difference, you'll gain 5 hours traveling from Barcelona to St. Lawrence Gap. Prepare for a bit warmer weather when traveling from Barcelona in June: high temperatures in St. Lawrence Gap hover around 35°C and lows are around 30°C. On the 3rd (Mon), wrap the sightseeing up by early afternoon so you can travel to Vienna. Give yourself a bit of retail therapy at Vienna Naschmarkt and Xocolat. Deepen your sense of the past at sights like St. Stephen's Cathedral and Historic Center of Vienna. The adventure continues: take in nature's colorful creations at Schonbrunn Palace, take a stroll through Graben and Kohlmarkt, admire the masterpieces at Belvedere Palace, and see the interesting displays at Imperial Palace (Hofburg). For other places to visit, photos, where to stay, and tourist information, refer to the Vienna trip planner . Explore your travel options from St. Lawrence Gap to Vienna with the Route module. The time zone difference moving from Atlantic Standard Time (AST) to Central European Time (CET) is 5 hours. Traveling from St. Lawrence Gap in June, expect nights in Vienna to be cooler, around 15°C, while days are little chillier, around 29°C. Finish your sightseeing early on the 6th (Thu) so you can travel to Istanbul. On the 7th (Fri), contemplate the long history of Galata Tower, take in the spiritual surroundings of Sultan Ahmed Mosque, get engrossed in the history at Hagia Sophia Museum / Church (Ayasofya), then explore the ancient world of Basilica Cistern, and finally appreciate the extensive heritage of Sultanahmet District. Keep things going the next day: get engrossed in the history at Topkapi Palace, then take in the spiritual surroundings of Suleymaniye Cami , then hunt for treasures at Kapali Carsi, and finally look for gifts at Mısır Çarşısı. Plan my Istanbul trip by asking Inpirock to come up with tips and suggestions. Traveling by flight from Vienna to Istanbul takes 5.5 hours. Alternatively, you can do a combination of flight and shuttle; or drive. Traveling from Vienna to Istanbul, you'll lose 2 hours due to the time zone difference. Plan for somewhat warmer nights when traveling from Vienna in June since evenings lows in Istanbul dip to 20°C. 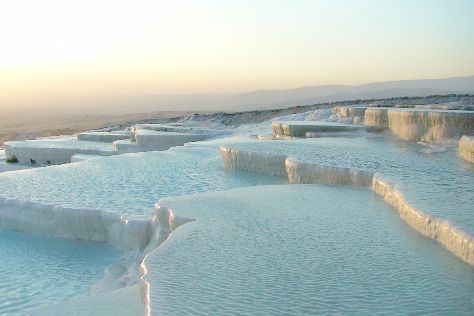 Finish your sightseeing early on the 8th (Sat) so you can travel to Pamukkale. On the 9th (Sun), witness a stunning natural landmark at Pamukkale Thermal Pools, take in the natural beauty of Cleopatra Pools, and then explore the ancient world of Hierapolis & Pamukkale. To see maps, other places to visit, ratings, and other tourist information, read Pamukkale trip planning website . Do a combination of flight and taxi from Istanbul to Pamukkale in 4.5 hours. Alternatively, you can do a combination of shuttle, flight, and taxi; or drive. Cap off your sightseeing on the 9th (Sun) early enough to go by car to Selcuk. Kick off your visit on the 10th (Mon): stop by Moon Light Souvenir Silver Shop, explore the ancient world of The Terrace Houses, delve into the distant past at Efes Antik Kenti Tiyatrosu, explore the ancient world of Ancient City of Ephesus, then explore the ancient world of Bibliotheque de Celsus, and finally contemplate the long history of Meryemana (The Virgin Mary's House). Get ready for a full day of sightseeing on the 11th (Tue): delve into the distant past at The Temple of Artemis and then stroll through Pamucak Beach. To find traveler tips, other places to visit, where to stay, and more tourist information, you can read our Selcuk trip planner . Drive from Pamukkale to Selcuk in 3 hours. Alternatively, you can take a train; or take a bus. In June, daily temperatures in Selcuk can reach 37°C, while at night they dip to 20°C. Wrap up your sightseeing by early afternoon on the 11th (Tue) to allow enough time to travel back home.